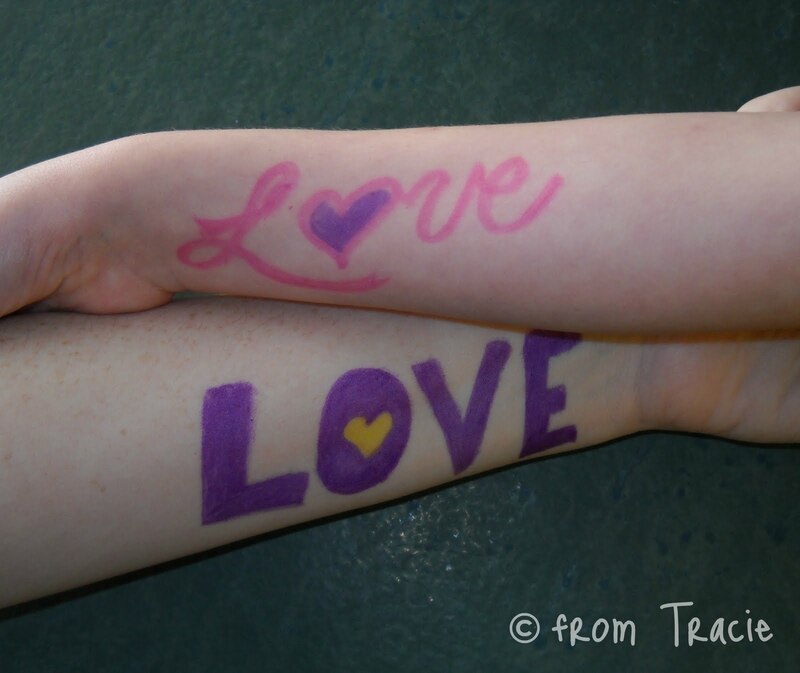 From Tracie: It is Time to Write Love! It is Time to Write Love! Today, thousands of people are writing LOVE with To Write Love on Her Arms, an organization dedicated to presenting hope and finding help for people struggling with depression, addiction, self-injury, and suicide. 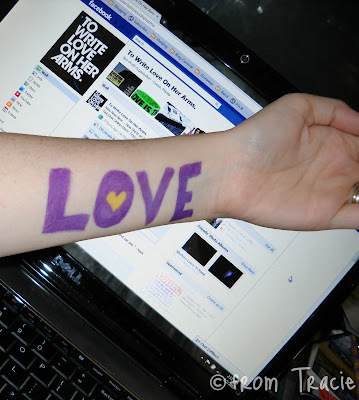 We write LOVE to raise awareness. We write LOVE to bring hope. We write LOVE to encourage those who are struggling. We write LOVE because we are worth it. Katarina saw my arm, and asked me about it. It was great opportunity to talk to her (in an age appropriate way) about the way that some hurts can be so BIG, and the best thing to do is talk about the things that hurt and ask for help. I told her that writing LOVE is a way to stand with people who are hurting and show them that they are loved. I had tears in my eyes, as I held her arm in my hand to write love. I had prayers in my heart, that she will never know the pain depression, addiction, and self-injury bring. You are in my heart today. I love this. You know how this hits home for me. Too close to home. My husband would probably take me in to get my head checked if I wrote that on my arm...but I am with you in spirit. You and your daughter are AWESOME & AMAZING! I love you & TWLOHA! THIS was beautiful! Love you heart, Tracie! You're awesome! how inspiring! I think I need to remember this the next time the thoughts bombard me. Thanks! Thank you Tracie for sharing on this. Blessings. As a person who suffers from bipolar disorder and self harm I thank you. There is so much stigma that surrounds our illnesses and it's nice to hear support rather than judgement. Thank you so so much. I think this campaign is beautiful. I love seeing all the pictures on Facebook. I also think it's quite beautiful to see her tiny arm with yours written with love. Powerful, Tracie. Love and peace to you and yours. dagnabbit you have to stop making me all teary eyed. Doug has a female friend who was recently diagnosed with borderline personality disorder and PTSD. She lost her fiance in a road side bomb in Afghanistan last September. Yesterday she was holding a cookout at her house and her papaw had a heart attack and died. She administered CPR which brought him back for about 5 minutes before he collapsed again, and the medics could not bring him back. I worry about her today.. I'm late to the party, but I am writing LOVE on my arm now. So important. New to your blog. Came from Dee's blog. I'm going to send this post over to two moms I know who are struggling with this with their teen daughters. How perfect that I came here.